Olivia West | Three Months — K L E P A C & C O . It's true when people say that they love each stage of their child's life more than the previous stage. The last few weeks leading up until month three have been a game changer. Is it too soon to say that I feel like I'm finally getting the hang of this whole life with a newborn thing? Baby girl is just packing on the weight like a champ. Her rolls are the real deal and we couldn't be prouder. 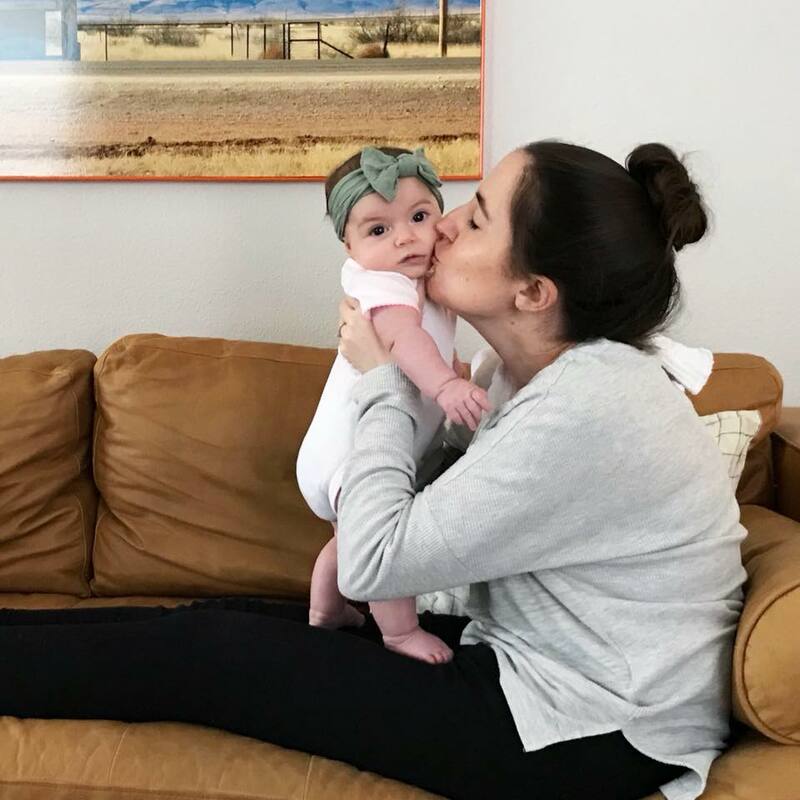 As you know from our first few weeks, we struggled with her gaining enough weight, so to visibly see her grow and change each day is everything. The three month mark is in bettween her two month and 4 month checkup, but according to our bathroom scale (so official) she currently weighs around 15lbs and is 23in long. It seems like her cluster feeding has curbed a bit, and she is now eating about every 2 hours which is really great with her current napping schedule (more on that below). I have started eating dairy again and it doesn't seem to be upsetting her tummy which I'm pretty excited about because I was missing my milk and cheese and ice cream. Now that she is becoming more social, eating is a little bit more challenging as she rather look around the room or smile at me rather than eat. Don't get me wrong, it's really sweet unless it's at 3:00am. You guys. I never thought I would utter these words. Olivia is sleeping in her crib. Like actually sleeping, By herself. FOR HOURS. I know. I have so much to say on this subject that I'm going to write an entire post dedicated to how we sleep trained her. But holy moly these sleep deprived parents could not be happier and prouder of our little girl. Within two days she was sleeping for 8 hours straight! And now she has even gone up to 10 hours a few nights. We've also developed a pretty solid bedtime routine (more on that later). Now that we have the night time sleeping under control we have been working on her naps during the day which are about 50% in the crib and 50% in my arms, but hey we're getting somewhere. Plus I love her cuddles. Her sleep schedule now has made her such a happy baby. It makes me wish we would have started sleep training her earlier, but we're still just trying to figure things out. So within a month Olivia has gone from her little coos and baby gurgles to full on conversations. She just goes on and on about her day and her baby dreams, I can barely keep up! She is also almost holding her head up completely now, it's just a little wobbly (usually when she's tired). She loves to "walk around and look at stuff" (that's what we call it. there's even a song.) She loves her best friend the ceiling vent. When she isn't eating or napping she loves when we read books, singing songs, and listening to The Beatles. A girl after my own heart. Because she is getting some solid sleep now, she is a lot easier to take places without a complete meltdown. So on the weekends we have made it a ritual to go for long walks around the neighborhood, visit the farmer's market, grab some gelato, and if we're really feeling frisky we'll venture to Target. We try to keep our little adventures around an hour as not to wear her out or interfere with her napping schedule. This past weekend had our first grocery store adventure! We were sure to go at 8:00am on Sunday when the place is empty, which was amazing. She loved looking at the lights and colorful items. She is a born shopper like her mama. As I mentioned earlier, she is finally packing on the weight. She has officially grown out of her 0-3m clothing and is now in 3-6m. When people say not to invest in baby clothes, I get it now. They seriously grow SO fast. Luckily for us though her sizing is right on target with her age so she's been a lot easier to shop and plan for. She has also moved up to size 2 diapers! Which means we have about 15 boxes of size 1 diapers we'll be exchanging soon. Whoops. I definitely think her sleeping in her crib and sleeping through the night is a HUGE milestone. Derek and I both feel like we're finally hitting our parenting stride, rather than just being sleep deprived zombies all the time. I mean we didn't sleep in the same bed for 10 weeks, we were like ships passing in the night. She is also now grabbing things on purpose and bringing them to her mouth, when before it was more of a grabbing and not knowing how to let go sort of thing. We also started this fun game where she "stands" on our laps and we bounce her up and down. She definitely had noodle negs at first but now she plants her feed and keeps her knees locked and just laughs and laughs when she "jumps". I just love how chatty she is now. We will talk and talk about all kinds of things. She is a great conversationalist. We took her to two events this month and she met lots of new friends. I've realized that having a baby is like having a puppy in public. All kinds of strangers will come up to you and you can hear girls audibly gasp to their boyfriends/husbands. Haha sorry buddy! Another favorite moment is now that she is getting plenty of sleep, she no longer wakes up crying we just hear her talking and squealing to herself every morning, and when you walk in she just lights up with the biggest smile! We love our girl.